Combine the basmati rice and turmeric coconut milk in a small saucepan and bring to the boil. Once boiling reduce to a simmer, cover and cook for 10 minutes or until all the liquid is absorbed. Once cooked allow to rest covered for 10 minutes before fluffing up with a fork. Season well with salt and pepper. While the rice is cooking heat the ghee in a large non stick frying pan over a medium high heat. Sprinkle the turmeric and cumin over one side of each cauliflower steak and fry spice side down. Season with salt and pepper before covering with a lid. Cook for 10 minutes or until golden. Once the cauliflower is cooked transfer to a plate and cover with foil to keep warm. Place the corn and cashews in the fry pan and sauté for 5 minutes or until rich in colour. Toss corn, cashews, coriander stalks and rice together in the pan. 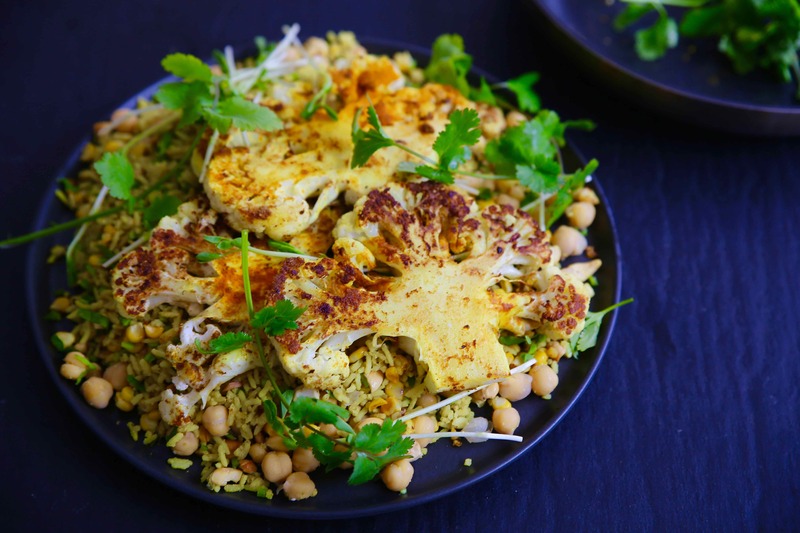 When ready to serve, place the rice mixture onto a serving plate and top with cauliflower steaks, coriander leaves and sprouts.